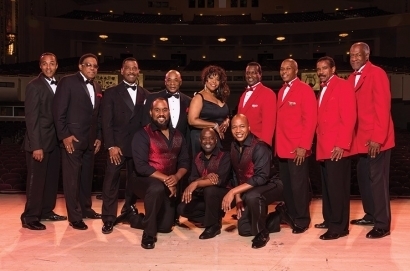 Tickets on sale Friday, May 4, 10 a.m.
Three Rock and Roll Hall of Fame legends will be on the same stage, for one night only when The Drifters, Cornell Gunter's Coasters, and The Platters come to The Mendel Center at Lake Michigan College on October 25 at 7:30 pm. With more than 94 charted records and 45 top 10 hits combined, you’ll hear favorites like “Under The Boardwalk,” “Stand By Me,” “On Broadway,” “This Magic Moment,” “Up On The Roof,” “Save The Last Dance for Me,” “Yakety Yak,” “Charlie Brown,” “Poison Ivy,” “Only You,” “The Great Pretender,” “Magic Touch,” “Smoke Gets In Your Eyes,” and many more. Tickets for this special engagement go on sale to the public this Friday, May 4, at 10 a.m. at www.TheMendelCenter.com, and through The Mendel Center Box Office at (269) 927-8700, option 1, and in person weekdays from 10 am to 6 pm. The history of rhythm and blues is filled with vocal groups whose names -- the Orioles, the Cadillacs, the Crows, the Flamingos, the Moonglows, the Coasters, the Penguins -- are held in reverence by fanatics and devotees. The Drifters are part of an even more exclusive fraternity, as a group that managed to carve out a place for themselves in the R&B firmament and also define that music, not only at its inception as a national chart phenomenon in the early '50s, but also in the decade that followed. Their place in history is as complex as their role in it, by virtue of the fact that there are two distinct phases to their music and the continuity of their membership, and their extraordinary longevity -- only the Platters could claim as great a span of years as an active recording unit. The Coasters were one of the few artists in rock history to successfully straddle the line between music and comedy. Their undeniably funny lyrics and on-stage antics might have suggested a simple troupe of clowns, but Coasters records were no mere novelties -- their material, supplied by the legendary team of Jerry Leiber and Mike Stoller, was too witty, their arrangements too well-crafted, and the group itself too musically proficient. That engaging and infectious combination made them one of the most popular early R&B/rock & roll acts, as well as one of the most consistently entertaining doo wop/vocal groups of all time. With classics such as "The Great Pretender," "Only You," and their rendition of "Smoke Gets in Your Eyes," the Platters were one of the preeminent doo-wop groups of the rock & roll era. Under the guidance of manager and producer Buck Ram, the Platters churned out hit after hit during the 1950s, bridging the gap between more traditional vocal-group stylings and the popular R&B grooves of the early '50s. Their sound was unique, marked by lead singer Tony Williams' powerful vocals and the feminine touch of singer Zola Taylor. The 1,559-seat Mendel Center Mainstage Theatre offers state-of-the-art acoustics and comfortable seating in elegant surroundings. Amenities include free parking, handicap accessibility, and an array of special services including valet parking, catering and bar service for private pre- and post-show events, booster seats for children, assistive listening devices, non-spill cups for beverages inside the theatre, and premium seats in the Stage Side section.